BEFORE: Free screenings continue with another teen comedy, Pitch Perfect. It features a mostly unknown cast, or rather B-list actors, with a few big names like Anna Kendrick and Elizabeth Banks scattered in. AFTER: Going into this film I wasn’t expecting a lot. The film appeared to be OK but nothing special; just an average, predictable romantic comedy. Suffice it to say, Pitch Perfect wildly exceeded my expectations. I was blown away by how funny and relatable this film was. The story revolves around multiple a cappella groups taking part in the national ICCA competition. It’s like an altered version of the TV show Glee with college kids instead of high school kids. There’s even the diverse population from popular kids, nerds, fat kids, arrogant know-it-alls, and many more. The surprising thing is, I don’t like Glee and yet I liked Pitch Perfect. I think the main reason is my feelings towards musicals. Every five minutes there’s another song to explain what’s going on and the songs are the major source of plot development. Take the songs out, your left with a couple minutes of dialogue that get the character’s feelings across. Another type of musical I don’t like is when people just randomly break out into song in the middle of nowhere for no apparent reason. Glee has regular stage performances but there’s also a lot of, “Hey we’re in the hallway! Why don’t we start singing!” It just makes no sense to me. Pitch Perfect on the other hand had all singing take place in realistic settings. Even when a song wasn’t sung on stage, Beca’s (Anna Kendrick) shower scene for example, was realistic because people sing in the shower. Another plus about the music is that I actually knew a lot of the songs. I’m one of the most musically illiterate people you’ll probably meet, and knowing a good 75% of the songs felt really good. I mentioned earlier that Pitch Perfect was funny. That’s an understatement. I was laughing out loud for the majority of the film. Beginning to end, myself and the rest of the theater were in what seemed like a constant state of laughter. A lot of credit must be given to Kay Cannon who wrote the screenplay. The dialogue and the situations these characters are placed in just exude hilarity. Also deserving of a lot of credit: the fantastic cast. It’s a great ensemble that works together and it’s this chemistry between everyone that leads to some great humor. But just as Melissa McCarthy stood out from the pack in Bridesmaids, so does Rebel Wilson in Pitch Perfect as Fat Amy. Yet another strength of the film is how relatable these characters are. I find characters that I can relate to be hilarious when they do something I would. For example, Jesse’s roommate (sorry I can’t remember the character or actor’s name) has a large Star Wars collection and does magic tricks. Not only did I find that funny because it’s a lot like me, but all my friends turned and stared at me when he came on the screen. Jesse (Skylar Astin) himself was also very relatable being a huge movie nut who loves to recite lines and reenact scenes from a film as its playing. The ending drew mixed reactions from the audience. It is quite abrupt and jarring which is probably why many people grunted in disgust, but I thought it worked well. Without giving anything away, it leaves the film in an interesting situation and reminds me of the ending to an old 80s sitcom (guesses anyone?). All in all, Pitch Perfect really delivered. Maybe it’s because I had such low expectations and now that I’ve hyped it up so much, you won’t find it as entertaining. 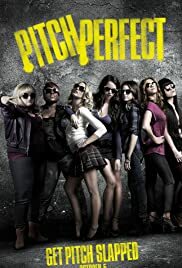 While this won’t be winning the Oscar for Best Picture, Pitch Perfect is by far the funniest film I’ve seen this year and I would highly recommend it. Pitch Perfect opens in theaters on October 5.